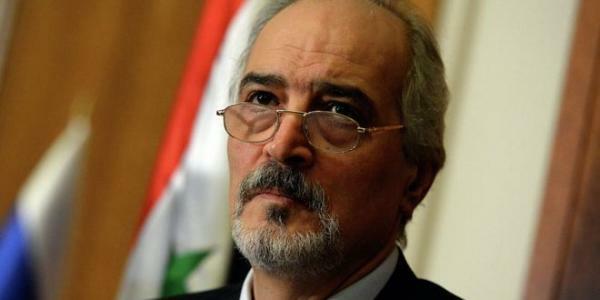 Syria’s Permanent Representative to the UN Dr. Bashar al-Jaafari stressed that Syria, despite the terrorist war, will not spare any effort to defend the Palestinians’ right to liberate their land and establish their independent state with Jerusalem as its capital. Al-Jaafari was speaking in a voice message sent to the participants of a festival held on Monday by the Palestinian People’s Committee for Solidarity with Syria in the occupied Palestinian territories of 1948. He said that the reasons behind targeting Syria are its rejection of the Israeli occupation of the Arab territories, its support for the resistance and its refusal to abandon the Palestinian cause and the occupied Syrian Golan. He also condemned the close ties between the Zionist entity and the armed terrorist organizations operating in the disengagement zone of the occupied Syrian Golan and treating injured members of terrorist groups in the Zionist hospitals at the expense of Qatari and Saudi regimes, adding that these violations are documented by UNDOF reports.